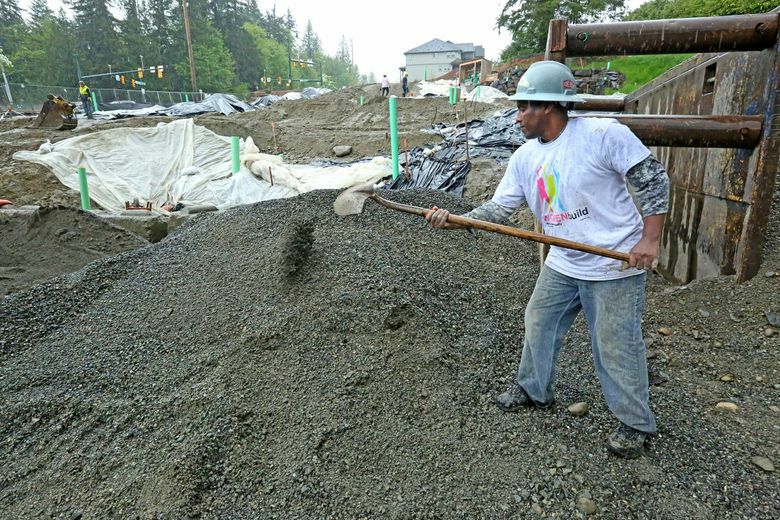 The cottage homes are taking shape in one of the Eastside’s wealthiest communities, on land donated by the city to increase its stock of affordable housing. 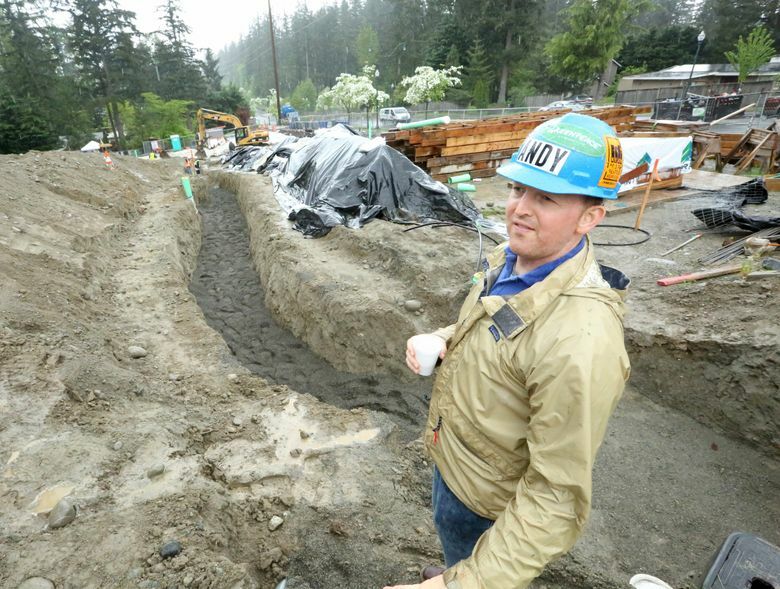 A drenching downpour at a muddy construction site in Sammamish did little to dampen the spirits of two future homeowners working on the foundations of what will be their new subsidized cottage homes in one of the Eastside’s priciest communities. Jamal Sadiq, a janitor at Overlake Hospital in Bellevue, and Abdulaziz Ahmed, a U.S. Postal Service driver, together with their families, qualified to live in this 10-homeHabitat for Humanity development on land donated by the city. With the median home price on the Eastside in May reaching $880,000, both men were nearly giddy that they had won a chance at the homes, which, though small, will cost them between $225,000 and $300,000 each. “There are very good schools here, very good stores. The library is just up the street. I want a good future for my kids,” said Sadiq, an Ethiopian immigrant. He currently lives with his wife and three children in a small, two-bedroom Seattle apartment that he said has a leaking roof and mold in the walls that aggravates his son’s asthma. With housing prices in the region climbing beyond the reach of low- and moderate- income workers, many cities on the Eastside are developing affordable-housing plans to try to maintain a diversity of housing types so that people who work in the communities can also afford to live there. At the same time, the Metropolitan King County Council is poised to create a Regional Affordable Housing Task Force and an advisory group to help set goals and develop strategies and financing to build and retain more affordable units. A county affordable-housing report in 2015 called the need “acute” and said nearly 50,000 households earning minimum wage are paying more than 50 percent of their income toward housing costs. The report recommended increasing the funding for affordable housing through several existing revenue streams, including issuing bonds against future hotel/motel taxes to build affordable housing near transit, using money from the Best Starts for Kids Levy approved in November 2015 to prevent homelessness for families, and increasing the Veterans and Human Services Levy, which expires in November. County Executive Dow Constantine last Mondayrecommended tripling the veterans levy to raise $60 million a year, $30 million of which would go toward affordable housing in the first year and about $15 million in subsequent years. The County Council will now decide whether to forward the measure to voters. With so many different potential funding sources, Balducci said the county needs to decide what initiatives will have the most impact for the most people. “The task force should answer the questions, ‘What are our goals, what are the plans to meet those goals, and what resources do we need to realize those plans?’ Bringing some coordination and rationality to the vision can only help,” she said. She said the task force will be made up of elected officials from across the county, while the advisory group will bring together housing experts and other stakeholders to inform the plans. Mark Ellerbrook, manager of Regional Housing and Community Development for King County, said one aim of the effort is to build political will and community support to address the affordable-housing crisis. “This is not a Kent problem or a Bellevue problem, but a regional problem,” he said. Affordable housing is also a social-justice issue, he said. African-American and Hispanic families are more likely than white families to pay more than half their income toward rent, according to the 2015 report. Seattle Mayor Ed Murray’s Housing Affordability and Livability Agenda committee set a target of 20,000 new units of affordable housing in the next decade, noting that the city currently builds about 800 per year. Ellerbrook said King County funded 828 units of affordable housing in 2016, including more than 100 for people exiting mental-health or substance-abuse treatment. He said it will be up to the task force to determine the county’s long-range needs. Some Eastside cities are also undertaking their own planning efforts. Redmond, Issaquah, Bellevue, Kenmore, Bothell and Kirkland have completed or are developing affordable-housing strategies, said Arthur Sullivan, program manager for ARCH, or A Regional Coalition for Housing, which pools member cities’ funding to finance affordable-housing projects in East King County. In Sammamish, Mayor Don Gerend said the city recognized that it lacked housing for families of different ages and incomes when it donated 1.3 acres of surplus city land to Habitat for Humanity Seattle-King County in 2013. The city has adopted other strategies, too, he said. It requires that 10 percent of new residential and mixed-use development in its 240-acre Town Center be affordable to families earning 80 percent of the area median income, or $72,000 for a family of four. And it has relaxed permitting requirements to add accessory dwelling units — houses up to 1,000 square feet — on existing single-family lots. He said city residents have been supportive of efforts to build more affordable housing. More than 100 people from eight different faith communities turned out in February for a blessing at the new Habitat for Humanity site, Gerend said, with many offering to volunteer over the next year to help build the cottage homes. Under the Habitat for Humanity model, homeowners help build their own houses or volunteer in other ways, contributing 250 to 500 hours in “sweat equity” to the value of their mortgage. The organization serves people making between 30 and 60 percent of the county median income, or $33,600 to $57,600 a year for a family of four. And the new owners pay no more than 30 percent of their monthly incomes toward the mortgage payments. 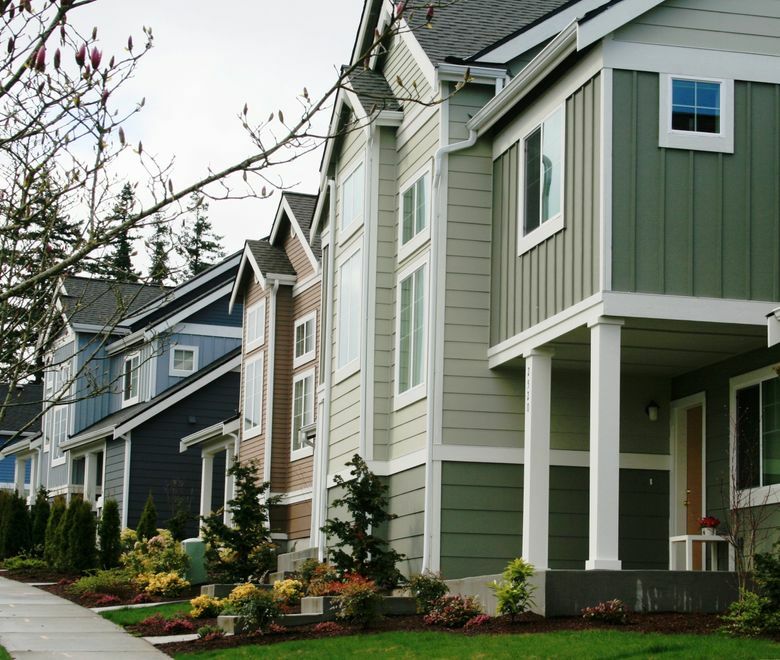 Gail Luxenberg, CEO of Habitat for Humanity Seattle-King County, said that in addition to meeting the income requirements, the new homeowners must demonstrate a steady income and rental history, as well as complete courses in financial planning and homeownership. The result, she said, is that most people stay in their homes at least seven years and either pay off their mortgages or sell their homes back to the organization. She said Habitat builds, or renovates and repairs, about 50 homes each year in King County, a number that depends on donations of volunteer labor and cash. Across the street from the future Sammamish cottage homes, Luxenberg noted, are new houses selling for more than $1 million. In its promotional materials, the developer advertises the proximity to quality schools, shopping and parks.